This is a Java Apple flower; usually they bloom full towards the beginning of summer time on this part of the world. My in-laws had grown one tree in their yard, my kids would love playing under this ‘tambis tree’ (Bisayan name) when all these little tendril-like whites would fall altogether, they would shout happily, it’s snowing, it’s snowing - what children in tropics can do much not seeing a real snow. oh, so this is the flower of tambis! they're blooming in summer. our neighbor used to have a tambis tree at the frontyard--it looked all pink in the summer. yay, kalimot naman ko ug apil ani nga meme Vernz hahaha. hehe.. kanindot sa tambis flower te..
mao diay na iya name ana te? ka pretty shot...nice! 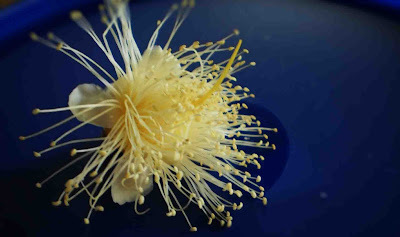 We call this a jambu air flower in Malaysia. The fruits are so juicy. I have this plant which is fruiting like crazy now. Love it. I love flowers . This is really very unique. I like the unique style of this flower with great colour mixing. Thanks for the beautiful sharing.